From Chanel pieces to the Hermes Birkin bags that Drake collects for his future wife, some of the most haute couture and iconic brands were showcased at the Tradesy X Illma Gore showroom opening that took place on November 8, 2017 in Santa Monica, California. Tradesy is known for bringing consumers and sellers together as a fantastic marketplace for women’s luxury fashion. The phenomenal platform gives sellers the opportunity to make money on items they may not use anymore while giving consumers the chance to save up to 90% on renowned brands including Louis Vuitton, Chanel, Gucci, and more. Many remarkable celebrities, influencers, and art enthusiasts enjoyed their time at the spectacular opening of the Tradesy showroom. 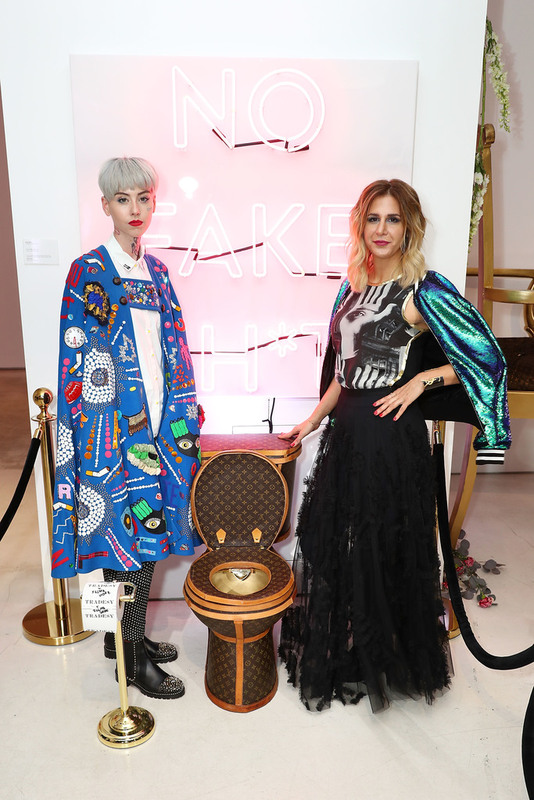 Westworld star, Evan Rachel Wood looked super chic in all black at the event and had a blast posing with artist Illma Gore in front of the event’s most talked about attraction, the fully-functioning, $100,000 golden toilet covered in Louis Vuitton leathers. Evan Rachel Wood shared the fabulous photos as seen below on her Instagram account. Singing sensation, Katharine McPhee had a wonderful time at the event admiring all of the outstanding pieces. She also chatted it up with Tradesy founder, Tracy DiNunzio about the hottest fashion trends. And now a #fbf from Wednesday’s event. Had a fab time checking out the new @tradesy showroom and their art collaboration @illmagore #tradeseytreasures p.s. I wanted everything! The Tradesy x Illma Gore showroom opening was fashion heaven for all attendees. It was hard not to be left on Cloud 9 with all of the stunning and luxurious fashion items at the event. In addition, guests were able to enjoy decadent hors d’oeuvres from chef Casey Lane’s restaurant, Vaile dei Romani as they were mesmerized by the gorgeous, fashion-inspired art pieces at the showroom including a Gucci clad missile, an American flag designed from Hermes scarves, busts of President Lincoln created from repurposed Louis Vuitton items, and more. You’ll definitely want to start your holiday wishlist as you’ll want everything from the Tradesy x Illma Gore showroom. Check out some more pictures below from the incredible event! Previous VIPAccessEXCLUSIVE: The Champions Of Magic Make Their Way To The US For The First Time Ever – Catch Them On Tour Now – RECAP Here! Next VIPAccessEXCLUSIVE: Lisa Vanderpump, Ken Todd, Lance Bass, Mario Lopez, And Many More Celebrated The 2nd Annual Vanderpump Dogs Foundation Gala – RECAP Here!